Suzuki Hayabusa RCC Ultra Turbo Kit 550 hp. If you are looking for the ultimate turbo kit for your Suzuki Hayabusa, look no further than the RCC Suzuki Hayabusa Ultra Turbo Kit. This is the ultimate street/strip kit with a liquid/air intercooler housed in a custom billet aluminum airbox and secondary injection. No refilling water injection kits with this baby, just add gas and you're ready to go!!! With the use of liquid to air intercooling you can safely run up to 380 hp on pump fuel, and make it extremely efficient 550 hp on race fuel. 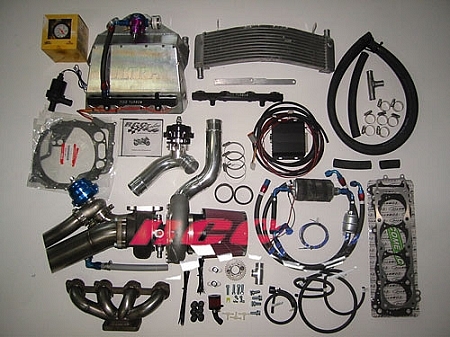 This kit comes with everything you need to build the Ultimate Hayabusa turbo kit. From the custom Garrett GT 35R turbo, 44mm V-band Tial wastegate or the 50mm Tial blow off valve, you are getting all top-of-the-line products with this kit. From the custom stainless steel header mounting the huge Garrett GT 35R turbo, pump up through a massive up-pipe directly into the billet aluminum water-to-air intercooled airbox. Supplementary fueling is handled by a secondary ECU fuel controller with a 40 psi internal map sensor, four secondary fuel injectors and fuel system. RCC Turbo really outdid itself with this kit. The intercooled airbox is simply a work of art. The efficiency of this turbo kit is unsurpassed in the industry. When you buy RCC Ultra Turbo Kit, you know you're purchasing the best turbo kit available. We also carry a full line of engine components, such as Connecting Rods, Pistons and Clutch Components, so you can build a motor capable of handling the horsepower this turbo kit produces. Due to the numerous options offered on the RCC turbo kits, each kit is custom-made per order. Please allow 3 to 4 weeks for shipping and processing. 11050 points will be rewarded to you when you buy this item.